Branson Tractors is proud to introduce the 7845 model tractor. The 7845 engine is genuine “Branson Built.” It is turbocharged, water cooled and is rated at a quiet 2500 RPMs. If you like lots of torque...this engine is for you. The heavy duty, sharp turning, front axle is a must for loader work. Branson’s 7845 front axle steers 56 degrees each direction, and does NOT use a drag link. Smooth, powerful and turns on a dime...you will like it! Levers, gear shifts, buttons and light panels are all designed logically for ease and simplicity of operation. 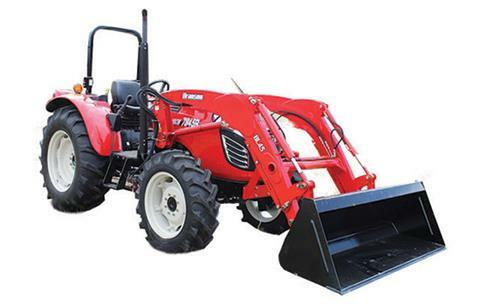 The 7845 tractor is available in a Cab or ROPs model. The power shuttle is completely electro-hydraulic in operation, is fully modulated, and very smooth. Dual-pump hydraulic system provides 19.3 gpm TOTAL FLOW. The steering pump provides 7.3 gpm and the function pump provides 11.5 gpm. Each pump is independent of each other, and makes hydraulic, loader, hitch and the steering system all function smoothly. OVERHEAD MOUNTED RADIO/CD: AM-FM radio with a CD player makes your time in the field more enjoyable. DELUXE SEAT AND OPERATOR’S PLATFORM: The seat is very comfortable with adjustments including a lumbar control. Operator’s platform and the cab is ergonomically designed, user friendly and spacious. TELESCOPIC LIFT ARMS WITH EXTERNAL CONTROLS: Implements are easier to attach, operate and maintain. With ROPS - 102.6 in. At hitch point - 3,820 lb. At 24 in. behind hitch point - 2,526 lb.